Our world is fast, growing faster. This pace effects many aspects of our wellness, even our eating. We’ve talked over time about what we eat in the Fat Guy’s Guide to Health section of the site. This article is devoted to not what, but how we eat. According to registered dietician Stephanie Vangsness, “meals have become yet another task we squeeze in during the day. It is all too common to hear of people grabbing breakfast on the run or attending a lunch meeting, where business is front and center and food is merely the bait to get people there” (2016). This leads to a pattern of “Mindless Eating”—eating with our attention on something other than the act of eating—which is the cause of millions of American pounds every year. Mindless eating is not just rampant in our boardrooms. It’s in our schools, with some statistics saying that the allotted average time a child has to eat lunch is 7-11 minutes. It’s in our homes at an epidemic level with the majority of Americans eating at least one full meal or multiple snacks while watching a screen. This is because “if the mind is multi-tasking during eating, critical signals that regulate food intake may not be received by the brain. If the brain does not receive certain messages that occur during eating, such as sensation of taste and satisfaction, it may fail to register the event as eating” (Vangsness, 2016). We’ve all had that feeling of not even having a moment to think, let alone eat, and we dash from our desks to the next task without feeling the food hit bottom. In such hectic days, it’s such a missed opportunity for pause, reflection and pleasure that would almost certainly increase productivity afterward by boosting our mood. We miss a similar chance at double the pleasure when we spend the time to make a great meal only to miss out on the full experience in front of the TV. We’ve looked at Mindfulness as a Street Level Wellness practice in Your Inner Indiana Jones where it was described as “…paying attention to your life, here and now, with kindness and curiosity,” by researcher and Mindfulness practitioner Dr. Amy Saltzman (2010) who also noted “there are many definitions of mindfulness” and it can be employed in many areas of our lives. In terms of eating, the ethos above is carefully applied to one small food item or one bite of food as we relish it. 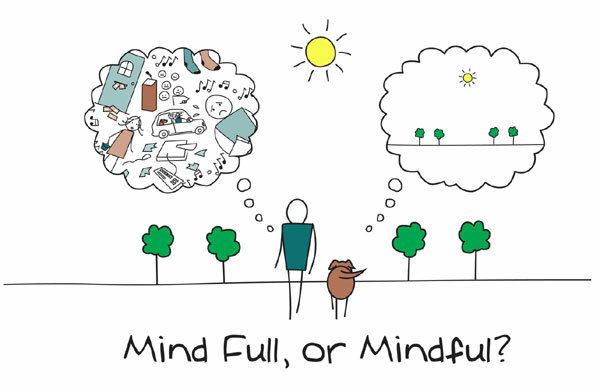 It is important to remember that mindfulness is a skill to be built and an exercise like this is like any type of physical exercise—a focused activity to increase an ability, in this case food awareness. Below is a script that can be generally applied to a single piece of food, a forkful or a meal. It was originally written by Mark Williams, John Teasdale, Zindel Segal, and Jon Kabat-Zinn (2007) with the focus on one single raisin. Feel free to check the link to see the full script or apply these prompts in order, with your own item. 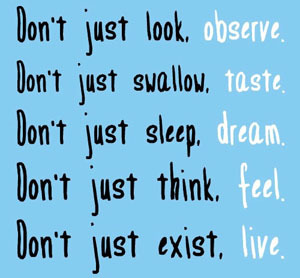 Swallowing – Yes, even this can be mindful and self-focused to “see if you can first detect the intention to swallow as it comes up…” and be present with that desire. With eating, as with life, we are seeking pleasure, satisfaction and peace. 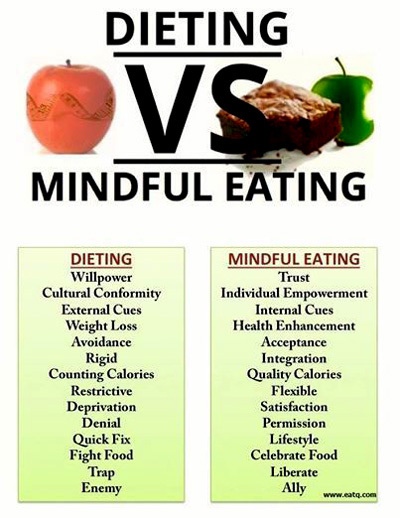 Mindful eating is a way to increase that with every meal, one bite at a time.